He was the guy who would miss 11 straight shots, then come down the court with everything on the line and drill the game-winner without blinking. 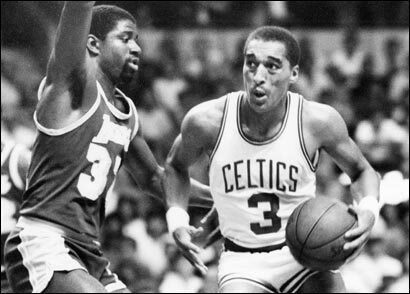 That's how I will remember Dennis Johnson, the freckle-faced bulldog who joined the Celtics in 1983 and was a pivotal member of the 1984 and '86 championship teams. DJ's role was often diminished amid the long shadows of Larry Bird, Kevin McHale, and Robert Parish, yet he was the one Bird singled out as "the best teammate I've ever played with." Johnson collapsed and died yesterday in Austin, Texas, where he was the coach of the Austin Toros of the NBA Development League. He was 52 years old, too young to have his life cut so terribly short. "What a sad, sad day," said McHale. "I tell you, this one really hits you. I was just talking to a friend who had just talked with DJ, and he was telling me how excited DJ was about his team. I guess his guys had started out losing eight in a row, or something like that, but lately they had been winning, and no one was happier about that than him. "I can't believe this has happened. First Reggie [Lewis] and now him. We're too young to be losing teammates like this." DJ was memorable on a number of fronts, but mostly for his ability to rise to the occasion when the games mattered most. "That's when you really appreciated him," offered Bird. "Not during a regular-season game in Cleveland in December." Johnson's career averages of 14.1 points and five assists per game don't begin to explain his value. He was an unorthodox point guard, a below-average shooter who was a tenacious defender during critical moments, who used his strength, moxie, and high basketball IQ to make exactly the right pass at exactly the right moment, or drill the big jumper when his team needed it. "I remember that time in the '85 Finals against the Lakers in [Game 4]," said Bird. "I got the ball on the right side at the top of the key, and they sent two guys running right at me. Out of the corner of my eye, I saw DJ was open and I said, 'Thank God.' I knew he'd hit it, and of course he did." One of Johnson's more memorable hoops was during the 1987 Eastern Conference finals against the Detroit Pistons, when Bird intercepted Isiah Thomas's inbounds pass and relayed it to a streaking Johnson. "He was stretched out on that play," Bird recalled. "He was using his right hand going in on the left side of the basket. But it never occurred to me he'd miss it. Not DJ. He told me once, 'I'm a horrible shooter. But give me the ball down the stretch and I'll hit it every time.' "
"He joked about that a lot," McHale said. "I can remember one season when he was going through a really bad stretch of shooting. Danny [Ainge] was always messing with him. He said, 'DJ, you miss every time. What are you doing?' DJ said, 'I'm just setting them all up for the playoffs. If I shoot bad now, they'll lay off me in the postseason, and I'll light 'em up.' "
For all his offensive heroics, though, it was his defense that set him apart. Johnson was acquired by Boston, in part, to slow up Lakers superstar Magic Johnson. A six-time NBA All-Defensive first-team selection, he became Magic's most formidable defensive adversary and haunted him the way Lakers defensive specialist Michael Cooper haunted Bird. Magic has often said no one bothered him more on the basketball court. "That was the thing about DJ," said Ainge. "He found more ways to help us win than any other player I've ever played with. "Whether it was hitting the shot, coming up with a steal, blocking a shot, or shutting down the team's best player, he would do it. I've said this many times: He was a true Hall of Famer." The fact that Johnson was not chosen for basketball's highest honor was one of a number of disappointments he endured after his playing days. DJ dreamed of being an NBA coach, but a messy domestic abuse incident involving his wife, Donna, hampered his efforts to earn a legitimate shot at such a job. Johnson did coach the Clippers in 2003 and was trying to work his way back to the big leagues when he collapsed. Bird said he was prepared to hire DJ as a scout for the Pacers when the NBA Development League job opened up. "He liked the idea of coaching," said Bird, who last saw his former running mate at his annual golf tournament in Terre Haute, Ind., last summer. Although Johnson won an NBA championship with the Seattle SuperSonics in 1979 and was named the Finals MVP, he was branded a "cancer" by Seattle coach Lenny Wilkens and traded to Phoenix. Upon his arrival in Boston, a loose bunch of Celtics were waiting with their own good-natured barbs to break him in. "I used to call him 'Chemo,' because I told him I didn't want him to spread his cancer," Ainge said. "And we called him 'Spot' because he had all those freckles on his face. DJ was a lot of fun. He took jokes well and he gave jokes well. He was a happy-go-lucky guy most of the time. And we all knew how much basketball meant to him." DJ came to Boston with a reputation as a difficult player, yet that dissipated early on in his tenure with the team. "We weren't worried," Bird said. "Who can't get along with [former coach] K.C. Jones? There were some days DJ would come into practice at [Hellenic College] and he'd say, 'I don't feel like doing this today.' We'd say to him, 'Then go sit down on the stage over there. You're not going to ruin our practice.' That's how we handled it. He only did that one day out of 10. The rest of the time he was a great, great teammate." Ainge said he spoke to Dennis Johnson about a week and a half ago to prep him on the arrival of Celtics rookie Allan Ray, who was assigned to his team. "He was excited to help," Ainge said. "He was excited about his job." It has been a tough season for Celtics fans. They've lost Red Auerbach, a ton of basketball games, and now one of the most clutch performers in their storied history. "It's going to take a while to sink in," McHale said. "I don't see DJ much. But whenever people ask me about him, I tell them how strong he was, how clever he was on the basketball court. He was bigger than most guys, and he had those freakishly long arms. He was better than anyone at stealing the ball. He'd just flick it, then go get it. "I loved playing with him." The rest of us loved watching him.